Photo highlights of Song Kul Lake, Kyrgyzstan and the two days from Kyzart on horseback to get there. 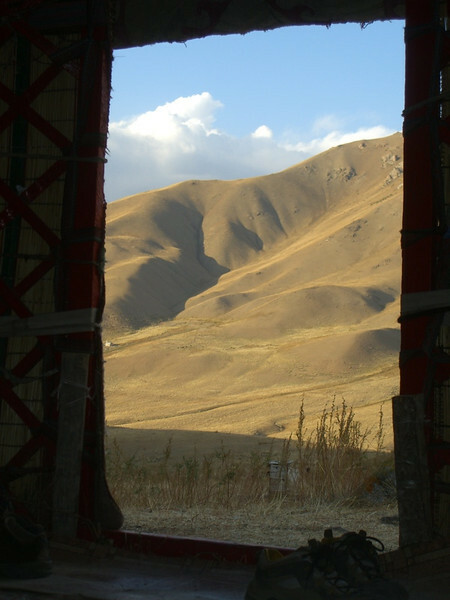 Read more about Kyrgyzstan's sights and cities and our Ramadan feast at Song Kul Lake. Horses and cows take a few last bites from the fading pastures of Kyrgyzstan before the long winter ahead. Read more about Kyrgyzstan's sights and cities and our Ramadan feast at Song Kul Lake. Dan and our guide take the lead on the start of the horse trek to Song Kul Lake, Kyrgyzstan. We were blessed with beautiful autumn weather and scenery. Read more about Kyrgyzstan's sights and cities and our Ramadan feast at Song Kul Lake. 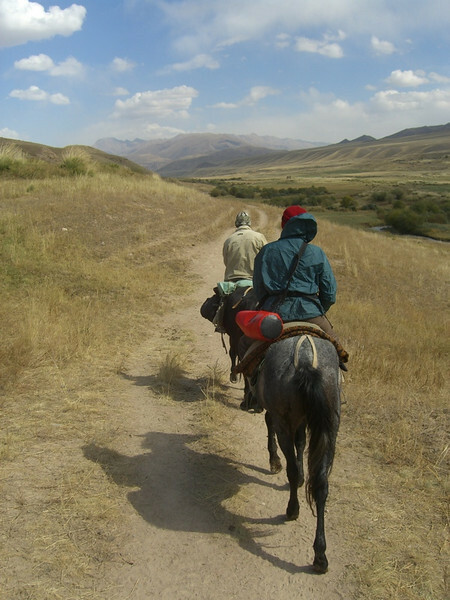 Dan had never been on a horse before the horse trek to Song Kul Lake from Kyzart. Here he gets a quick lesson from our guide on how to ride and direct a horse. 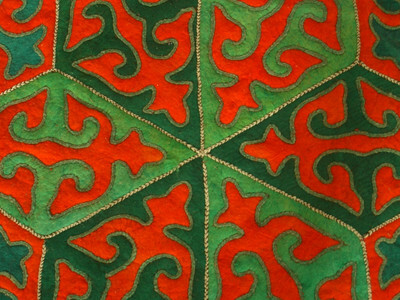 Read more about Kyrgyzstan's sights and cities and our Ramadan feast at Song Kul Lake. 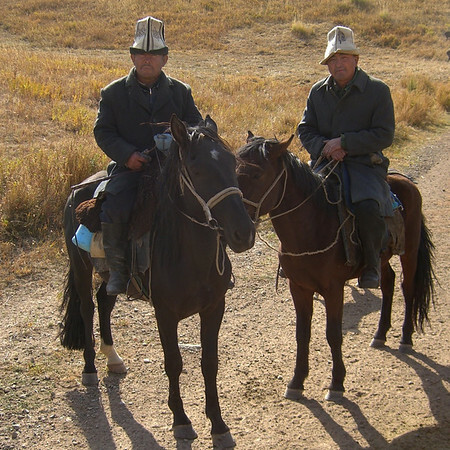 Two Kyrgyz men in kalpaks (traditional Kyrgyz hats) meet us on the path near the summer pastures of Jumgal. 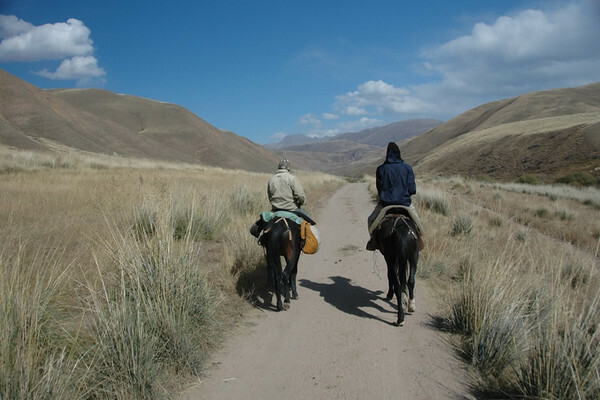 Horse riding seems to be in the blood of the Kyrgyz people. Read more about Kyrgyzstan's sights and cities and our Ramadan feast at Song Kul Lake. The first day of our horse trek from Kyzart village towards Song Kul Lake was absolutely amazing - blue skies, white clouds, yellow fields of grass and wheat, mountains and hills on all sides. Audrey had not been on a horse in 20 years, while it was Dan's first time on one. And he took all the photos!! All things considering, we managed quite well. 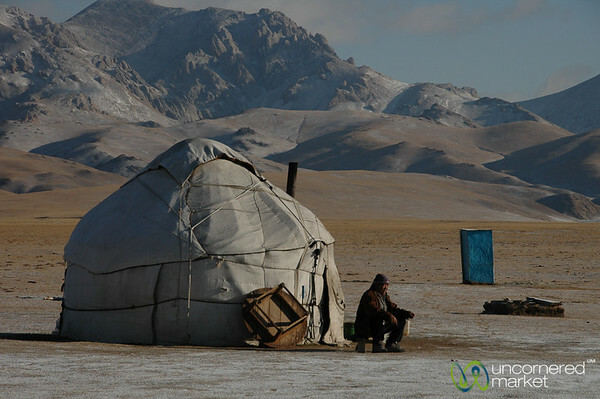 Read more about Kyrgyzstan's sights and cities and our Ramadan feast at Song Kul Lake. 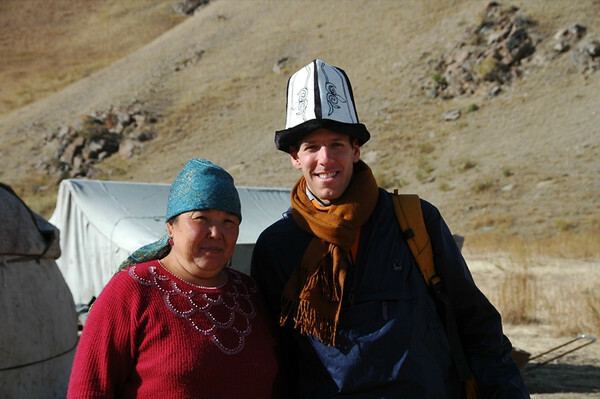 Dan dons a kalpak (a traditional Kyrgyz hat) on the second day of our horse trek. Our host wanted a photo with this "handsome Kyrgyz man." Read more about Kyrgyzstan's sights and cities and our Ramadan feast at Song Kul Lake. 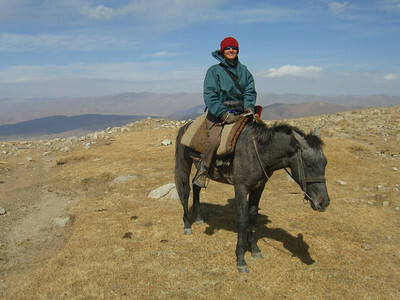 Audrey's Eeyore-looking horse appreciates a break after the long haul over the 3300 meter pass on the way from Kyzart to Song Kul Lake. 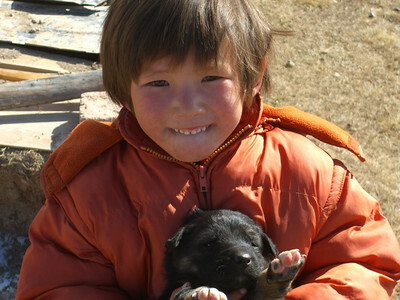 Read more about Kyrgyzstan's sights and cities and our Ramadan feast at Song Kul Lake. 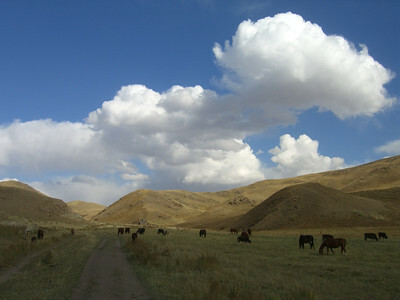 A jailoo in Kyrgyz is a high pasture where people take their animals to graze for the spring and summer months. 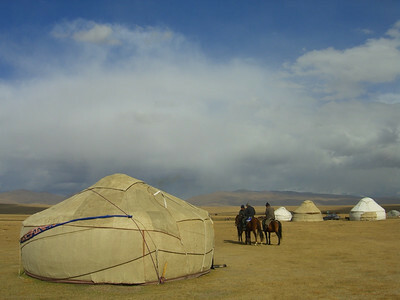 People erect yurts to live in during this time. 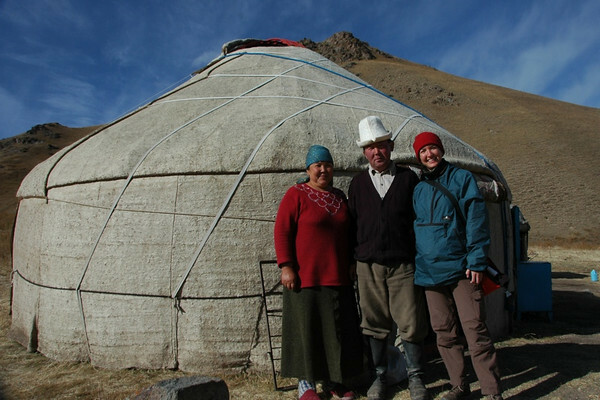 We stayed with this family on the way from Kyzart to Song Kul Lake. 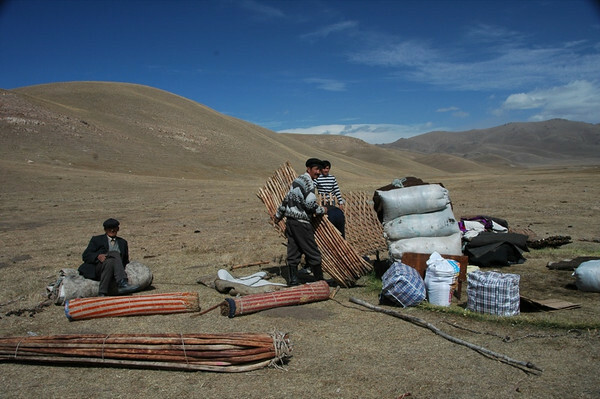 Many of their neighbors had already returned to the village for the winter, but they were still in the hills. 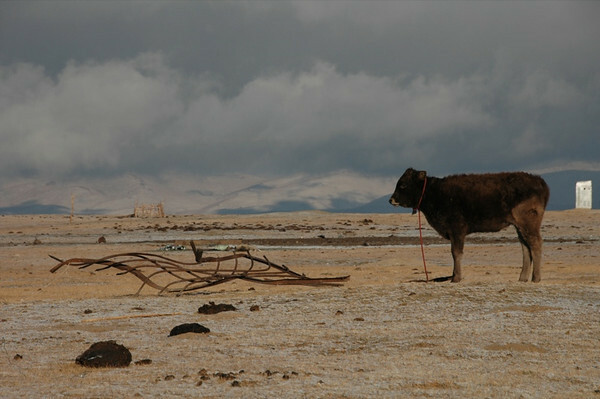 Read more about Kyrgyzstan's sights and cities and our Ramadan feast at Song Kul Lake. 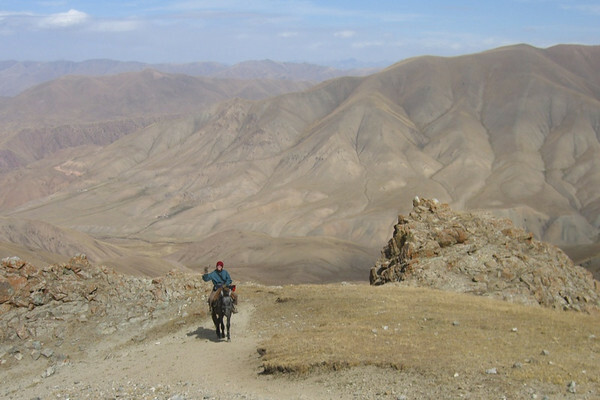 Audrey offers her horse a few words of encouragement to help it cross the pass (3300 meters) on the way to Song Kul Lake from Kochkor. It was a steep and rocky climb. Our horses, with their skinny ankles, proved rather agile and made fairly easy work of the narrow rocky paths. Read more about Kyrgyzstan's sights and cities and our Ramadan feast at Song Kul Lake. 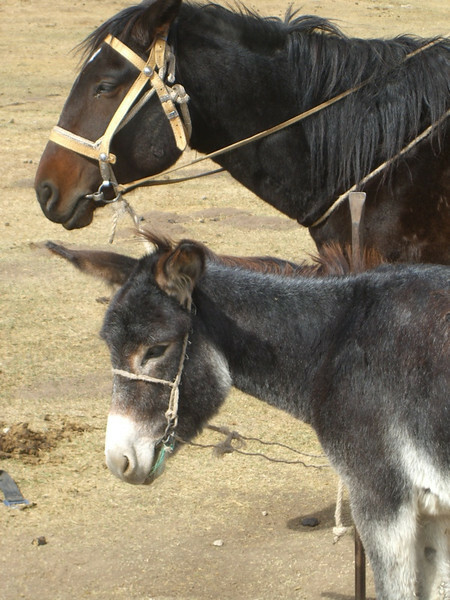 A an apt pair of friends at a yurt post just shy of Song Kul Lake, Kyrgyzstan. Read more about Kyrgyzstan's sights and cities and our Ramadan feast at Song Kul Lake. When arrived at the planned lunch stop on the second day, there was no lunch, let alone food. 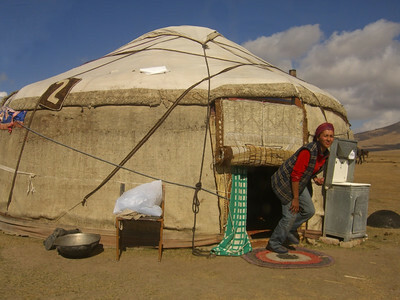 The family had already taken down the yurt and were moving back to the village for the winter. So, we pushed on to Song Kul Lake for a late afternoon meal. Read more about Kyrgyzstan's sights and cities and our Ramadan feast at Song Kul Lake. Our hosts head down to the river to fetch water for breakfast tea and porridge. We were at Song Kul for the first snow. Catching the first snow seemed to be trend for us in Kyrgyzstan. Read more about Kyrgyzstan's sights and cities and our Ramadan feast at Song Kul Lake. 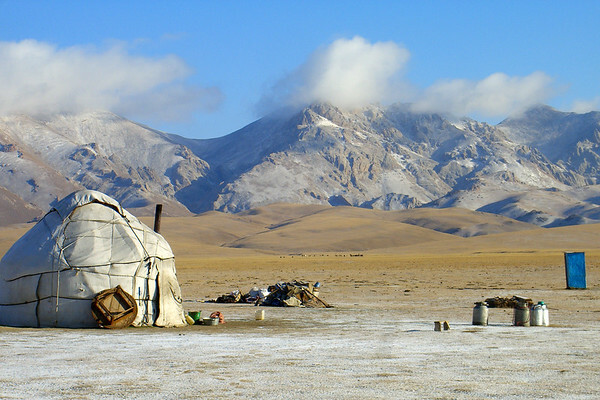 First snow on yurt and mountains at Song Kul Lake, Kyrgyzstan. Read more about Kyrgyzstan's sights and cities and our Ramadan feast at Song Kul Lake. Cow at Song Kul Lake, Kyrgyzstan Read more about Kyrgyzstan's sights and cities and our Ramadan feast at Song Kul Lake. This woman was our host for the night. 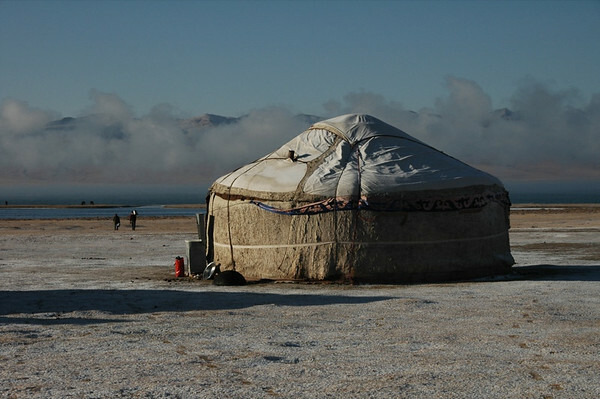 She kept us fed and prepared us endless pots of tea to ward off the frosty chill of Song Kul Lake. Read more about Kyrgyzstan's sights and cities and our Ramadan feast at Song Kul Lake.